Aberdeen Athletes Take Belfast By Storm. Aberdeen’s own National Karate Institute had more than just the luck of the Irish behind them on their recent trip to the Emerald Isle. Dedication and perseverance paid off. 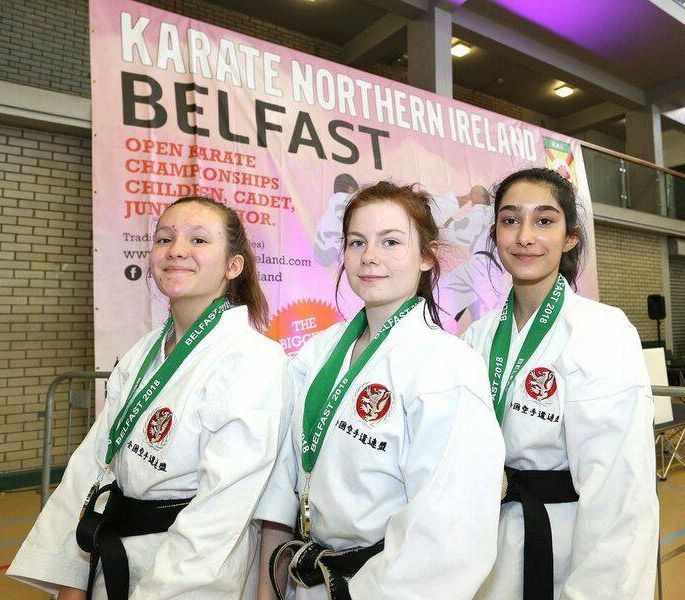 They were representing the city on the world stage during the Belfast Open World Karate Championships held in Northern Ireland, on 29th of April 2018. While many of us folks back home were tucking into our Sunday lunches and firing up the barbecues the Aberdeen athletes were burning off the calories and fighting their way through some really tough competition to win a staggering 34 medals. The self-funded NKI enjoyed some great results bringing home 12 gold medals against fierce competition from the Irish and other countries. There were 16 different Karate Federations taking part. “Our team were outstanding. I’m absolutely delighted! It’s a fantastic result. All the team have been training really hard, some since the age of 7. To get so many medals against such fierce and overwhelming competition from around the world is remarkable. “We were heavily outnumbered and underfunded, but these results show we were not out-classed. “For such a small club from a small country we proved we have what it takes, against all odds, and I am so proud we can deliver for Aberdeen and Scotland. Invitations for the NKI squad to perform and teach Karate have been coming in from around the world. 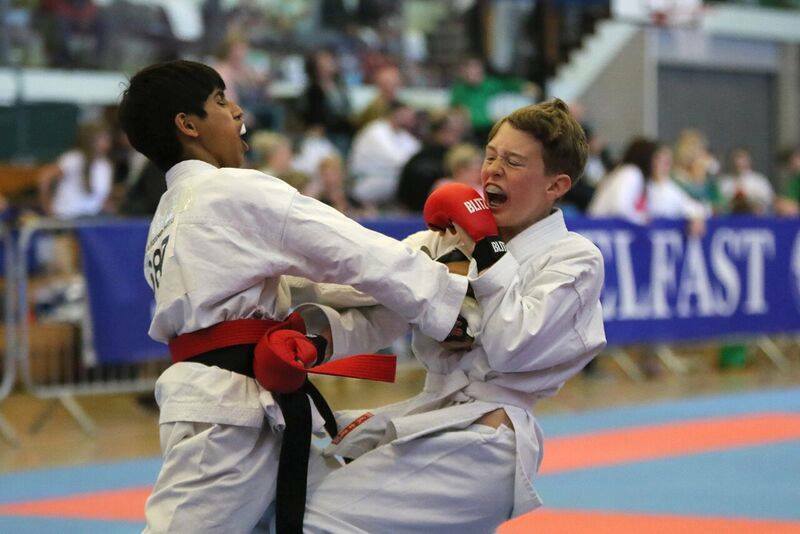 The NKF squad are back in training now and are aiming for success at the next festival, The International Karate Festival, which they will host themselves in Aberdeen this Summer. Anyone interested in training Karate should call Aberdeen 734607 for more information. The club meet in Aberdeen, Cults and Inverurie. Gold 12 Silver 15 Bronze 7 Total 34 Medals!! 1st – Kai Dark, Sophie Johnston, Nikita Kevra. 2nd – Stuart Odell, Curtis Thornton, Ian Wallace. 1st – Yasmin Parsa, Leah Provan, Charlotte Walker. 2nd – Chloe Calder, Nissara Kirk, Emma Stuart. 1st – Nissara Kirk, Chloe Calder, Emma Stewart. In an initiative by Aberdeenshire’s Democratic Independent and Green councillors Councillor Martin Ford is asking Aberdeenshire Council to ‘give consideration to the feasibility of creating a significant visual arts, museum or other cultural facility as part of its redevelopment of the Harlaw Road site in Inverurie’. Cllr Ford’s call comes in a notice of motion he has submitted for debate at the next meeting of Aberdeenshire’s Education and Children’s Services Committee on 23 March. It has only been possible to submit notices of motion for debate at Aberdeenshire Council’s policy committees since 27 January this year when the Council’s new scheme of governance was introduced (previously notices of motion were restricted to Area Committees and full council). Committee chair Cllr Alison Evison has confirmed Cllr Ford’s notice of motion will be included on the agenda for next week’s Education and Children’s Services Committee meeting. “The motion doesn’t commit the Council to anything beyond an exploratory process. But it’s an exploratory process we should do, and we need to do it now before the site is master-planned. “Essentially, the motion asks the Council to think about the possibilities, and have discussions with others. Why would it not do that? “The motion is deliberately not prescriptive about the kind of facility. That needs to be discussed and a decision emerge from consultation and dialogue. “Personally, I rather like the idea of an ‘Aberdeenshire Museum’, but that’s clearly just one possibility. I want to see what comes out of the discussion and consultation that I hope results from the motion I have tabled. “The point is, who would have predicted the V&A going to Dundee? Someone had to suggest it, against all reasonable expectation, and it happened. “There is certainly room on the Harlaw Road site. 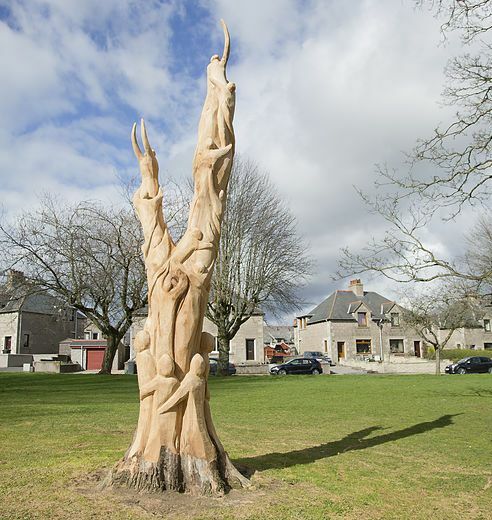 “A major cultural facility would bring significant benefits for the Aberdeenshire economy and tourism. It would also contribute to the quality of life for residents and raise the profile of the area. “This is a good idea. At this stage, agreeing the motion does not commit the Council to expenditure, it only opens the door to exciting possibilities. 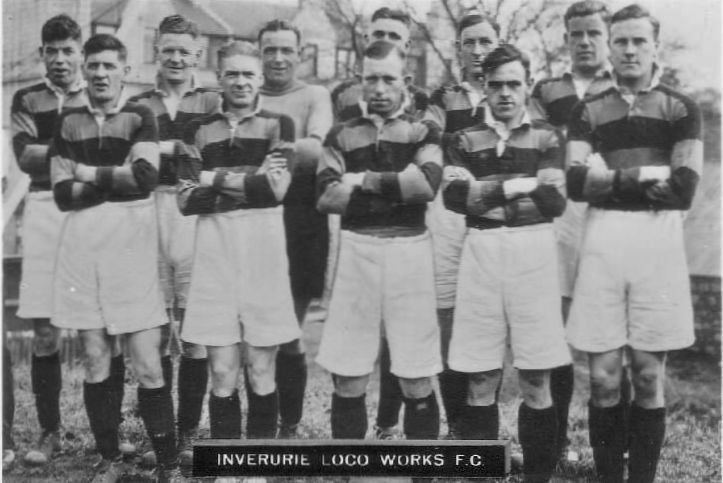 As part of the Garioch World of Words Festival, Inverurie Loco Works FC this week hosted the official launch of ‘If Goalposts Could Talk – The Life and Times of Inverurie Loco Works Football Club’. Duncan Harley reports. Researched and written by club historian David R. Fasken, the 400pp book covers the period from the clubs founding in 1902 right up to the present day. Fully illustrated with both GNSR and Loco team photos – many previously unpublished – the book explores the formation of the club – a full year prior to the founding of Aberdeen FC – and reveals the origins of that famous red and black strip. This social and sporting history authoritatively records the trials and tribulations of a team founded by the railway workers of the Great North of Scotland Railway Company. From early days as a successful Junior Club through to entry to the Highland League in 2001, the Locos have played uninterrupted at Harlaw Park for well over a century. Famous past players such as Kintore born, Loco half back and twice Scotland Manager, Andy Beattie take centre place alongside 1920’s local heroes Willie “Winkie” Young and Henry “Corker” Ross. Fans of the club will relish this book and residents of Inverurie will recognise many of the players and events described. This is not just another football club history. The matches, the scores and the long journey to Highland League status feature in detail – but alongside these, the author has woven a finely crafted tale of local lads, local pride and local history. “If Goalposts Could Talk” is essential reading for sports fans everywhere plus anyone interested in the social and industrial history of Scotland, Inverurie and the North East. Available from local outlets such as Strachans and Gibbs of Inverurie plus the club website at: www.inverurielocoworks.co.uk from 8th September price £20. The September edition of Leopard Magazine features a full review of the book. With thanks to Ian McLaren, Innes Associates. 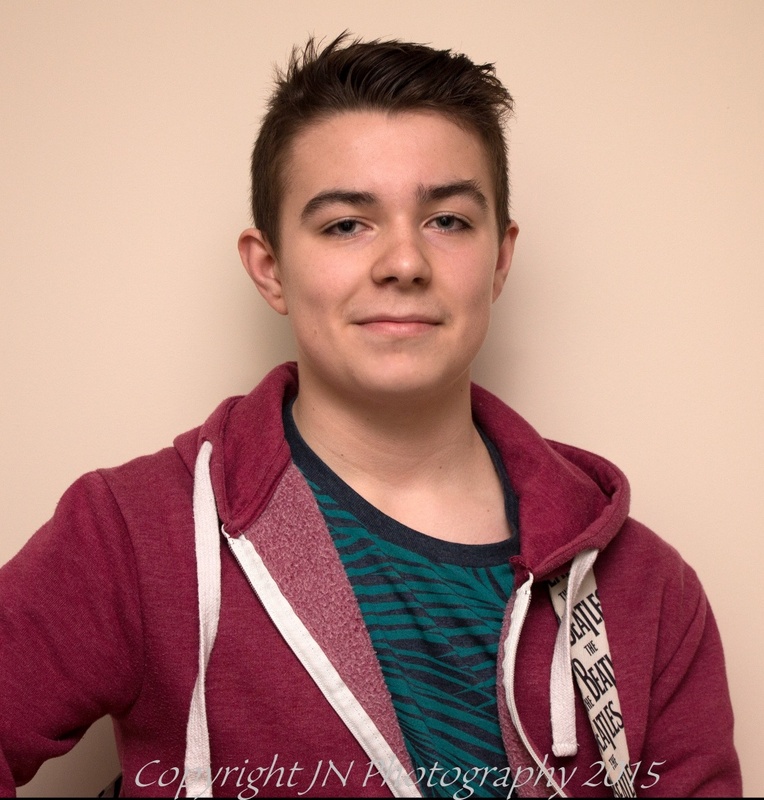 Pictures: JN Photography. Excitement is building for the north-east’s largest youth singing contest, ahead of this Saturday’s grand final. The NEX Factor singing competition, sponsored by Apex Industrial Chemicals and RSL NDT, highlights the most promising music stars between the ages of 13 and 19 from across Aberdeen, Aberdeenshire and Moray. 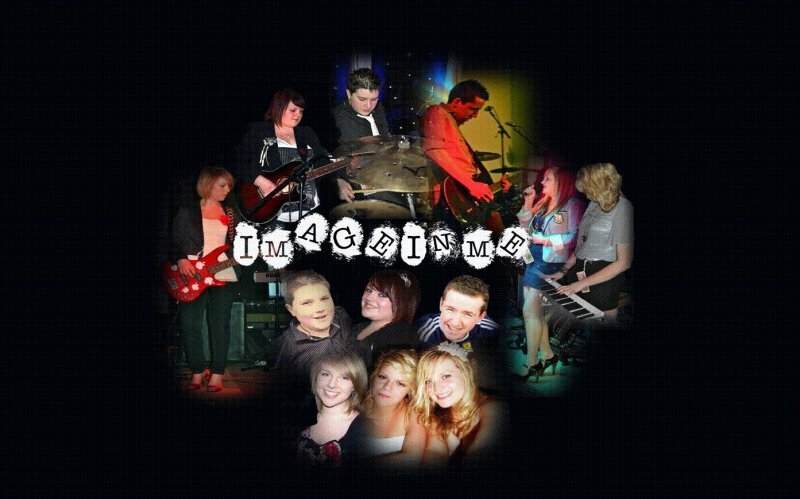 Twelve talented teenage acts will line up in the final at the Thainstone Exchange, Inverurie on Saturday, 30 May 2015, with all funds raised going to Aberdeen-based charity Cash for Kids. Over 100 youngsters applied and through a series of auditions the judges whittled the field down to the final 12 acts – 11 soloists and one duo – to vie for the 2015 NEX Factor title and win a fantastic first prize. This year’s winning act will receive £1,000 in prize money, a session at a recording studio, a personal art portrait, plus an amazing day out in London with world-renowned music artist Emeli Sandé, Aberdeenshire’s most successful pop star. The 28-year-old multi Brit Award winning singer songwriter, who has had three number one singles in the UK, was keen to give her time to the winner of the NEX Factor after hearing about the competition’s charitable contributions. Each entrant was asked to donate £5 to Cash for Kids to help support local young people of a similar age who are ill, disabled or disadvantaged. This year the NEX Factor also attracted interest from the X Factor production team who asked event organisers for talent recommendations for the hit Saturday night show. Around 700 people are expected to pack into the Thainstone Exchange for Saturday’s final with the audience voting for the winner. Tickets are selling quickly, and all proceeds from the contest will go to Cash for Kids, which raises money for the welfare of local young people under the age of 18 living in Aberdeen and Aberdeenshire. “This year’s NEX Factor final is set to be a fantastic event. The finalists are of an extremely high standard. Regardless of who triumphs on the night, all of the finalists have done really well to get to this stage and I’m sure have very bright futures ahead of them. Those in the audience on the 30th will have a difficult job selecting the winner, but in years to come they can say they helped put these youngsters on the road to stardom. This year, all but one of the finalists is female. Each finalist will perform two songs chosen by themselves and they will line-up on stage in the following order: 18-year-old Courtney Murphy from Mintlaw; Tammi Whyte, 15, from Aberdeen; 17-year-old Alannah Moar from Laurencekirk; Banchory’s Anna-Louise Barton, aged 16; 14-year-old Kyle MacRitchie from Inverurie; Megan Williams, 17, from Dufftown; Rebecca Henderson, 16, from Kennethmont; Bucksburn’s Rachel Brechin, aged 18; 16-year-old Bambie from Inverurie; Talitha Brown, 17, from Aberchirder; 15-year-old duo Amie Flett from Bridge of Don and Megan O’Brien from Balmedie; and Iona Fyfe, 17, from Huntly. Tickets for the NEX Factor final are priced at £15 per person and can be purchased via the Cash for Kids website at www.northsound1.com/charity/fundraising-appeals/nex-factor/. Built for the London and North East Railway Company in 1937, the streamlined green liveried steam locomotive pulled in at Platform One for a one hour stop to allow both rail enthusiasts and interested passers by an opportunity to admire a potent symbol of a bygone age. Originally operating from Edinburgh’s Haymarket, this engine later transferred to Aberdeen and hauled the last passenger steam train from Kings Cross on 24th October 1964 before finally being withdrawn from British Railways service in 1966. A similar locomotive the “Mallard” holds the world steam engine speed record having clocked over 125mph (202 km/h) in 1938. The Union of South Africa’s passengers on Saturday were enjoying the nine day “Great Britain VII” rail tour run by the Railway Touring Company. Leaving London Victoria on April 26th the steam tour had made its way north via Beattock Summit, Mallaig and the Glenfinnan Viaduct of Harry Potter fame before returning via Inverurie to London’s King’s Cross Station on May 4th. 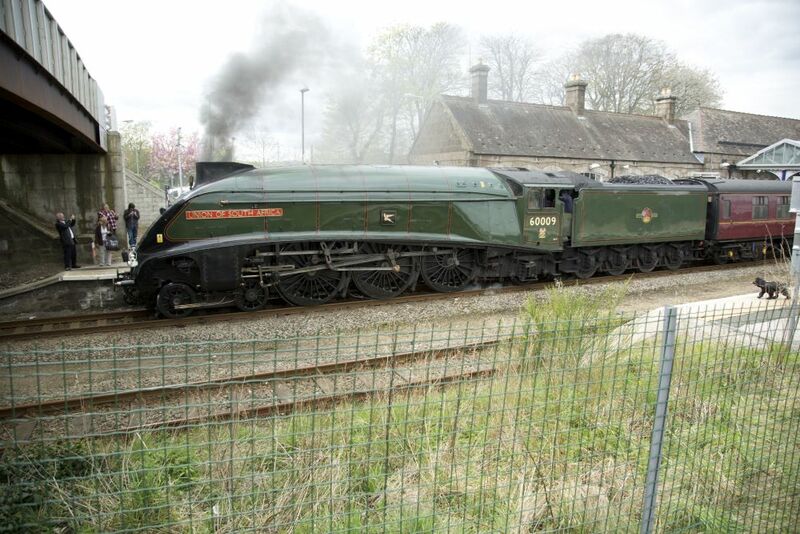 LNER Class A4 4488 Union of South Africa at Inverurie Railway Station – Credit: Duncan Harley. It’s hardly surprising that enthusiasts hark back to a golden age when trains not only transported folk around the country, but did so in some style. Saturday’s visit by the Union of South Africa certainly drew crowds, although one concerned local had seemingly been drawn to attend only because he assumed that the plume of smoke emanating from the station signified a train on fire. He soon joined excited onlookers however and, after pulling out his phone, began sending pictures to all and sundry. 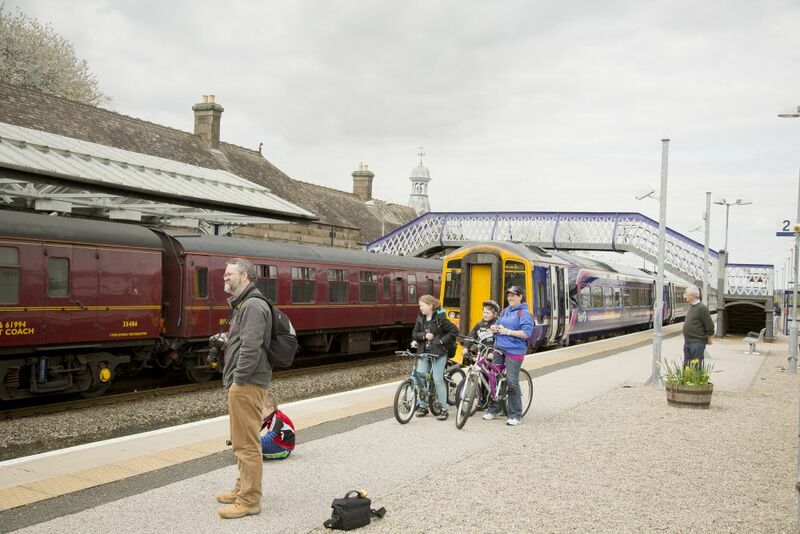 There are over 100 heritage railways currently operating in the UK including Aberdeenshire’s Alford Valley Narrow Gauge Railway and The Royal Deeside Railway near Banchory. If a nine rail day trip is beyond your reach then perhaps a day trip on a local scenic railway could fill in a very pleasant summer afternoon. For many years the River Urie has meandered at will over the farm land at Souterford. Flooding of the area is an annual event and even Environment Secretary Owen Paterson is completely powerless to prevent it. 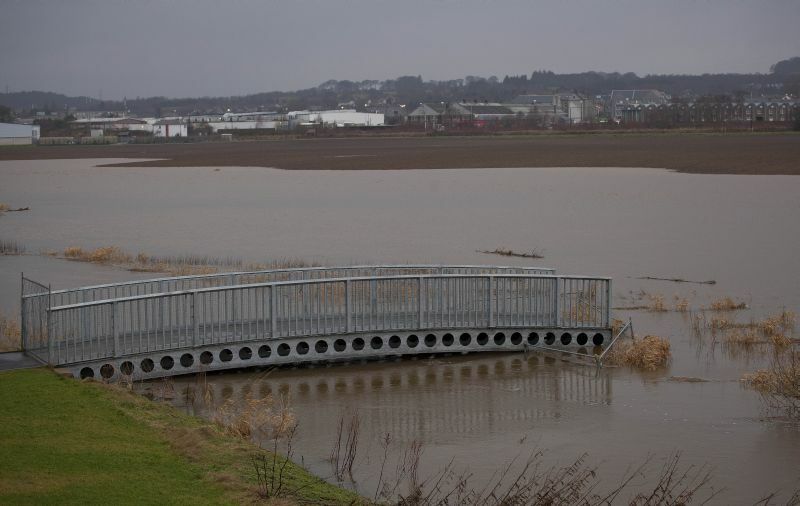 The Scottish Environment Protection Agency (SEPA) last week issued an updated flood alert for Aberdeenshire and Aberdeen City and asked local residents to remain vigilant and to take action to “protect yourself and your property”. There was, however, no flood warning issued for the Aberdeenshire town of Inverurie despite a worrying increase in the level of the River Urie. Following some very heavy rainfall during the past week the Aberdeenshire town’s Souterford area, just off the B9170 Oldmeldrum to Inverurie highway, was in fact flooded and this caused concern to many residents of the Inverurie Osprey Village development who were keeping a watchful eye on the flood situation as the River Urie bursts its banks yet again and water levels in the area continued to rise. This is of course not a new problem. 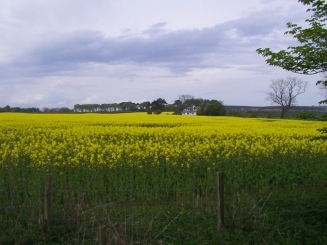 In fact the River Urie has been responsible for flooding the area around Inverurie for hundreds if not thousands of years, leading some local residents to conclude that was the reason why the historic town was built a few hundred metres to the South West of the rivers natural course in the first place. In the view of many locals, the decision by the Gordon House planners to permit residential and retail development on such a vulnerable site was surprising say the least. Souterford is seemingly a flood plain and where a flood plain exists, rivers will tend to meander and on occasion create temporary lochs before draining seawards in the spring season. A local Inverurie resident living with his partner in the towns Birch Drive observed that the water levels were “very alarming” and “almost within reach of the foundations” of his newly purchased 3 bedroom house. “If I had been told about the flooding problems, I would never have bought this house” he said. “We moved here from London and never expected anything like this, the home report made no mention of flood risk. The adjoining retail park has also suffered from flooding of the car park since opening in 2009. Business owners declined to comment but staff report a decline in sales due perhaps to the deep water which customers require to negotiate after parking their cars at the East side of the car park. Barratt Homes declined to comment regarding the flooding issue and their website currently advertises the “Final Phase” of Osprey Village with the comment that “this site is not available”. Some recent buyers of houses on the flood plain may have reason to wish that the companies claim regarding the unavailability of the site had been visible prior to purchase. The new Barratt Homes 2014 housing development at Souterford is somewhat aptly named Osprey Heights and is situated some 20 metres above Osprey Village. In the hopefully unlikely event of water levels threatening Osprey Heights, all of Aberdeenshire may have a problem. If you or any member of your family are unsure about what to do to prevent flooding in your area, advice and information is readily available by calling Floodline on 0845 9881188. “The difference between the right word and the almost right word is like the difference between lightning and the lightning bug” Mark Twain. 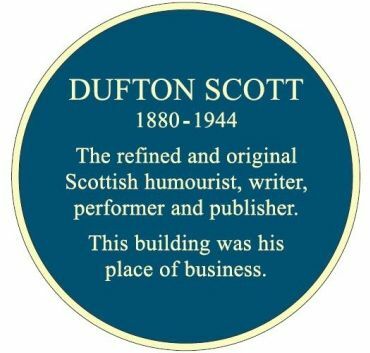 Aberdeen Voice carried a feature last year about Katie Scott’s quest to have a commemorative plaque erected in Inverurie for her grandfather, the Doric writer and performer Dufton Scott. Here’s Katie’s update. My task was to have a plaque designed and made. The chosen plaque makers, Leander Architectural, were very supportive and helpful, offering me several designs from which to choose. I was clear about the wording; it needed to include, Dufton Scott – the refined and original Scottish humourist. But this sparked some debate in the family. Do we say Scots or Scottish or, dare I say it, Scotch? This led to some interesting research. Scot free – very interesting! Scotch myths and Scotch mist, Scotch broth, Scotch tape, more commonly Sellotape. Then we have English, Scottish, Irish, British, but American, Australian, Norwegian, Saudi Arabian, Brazilian. This was a most enjoyable and interesting detour, as I love words and looking at their origins and derivatives and so on, but the choice seemed to be made for me. Dufton had described himself as Scottish humorist on an advertising flyer which I have. Note the spelling of his occupation , which led to another battle of words. A potentially expensive one for me, as I will shortly explain. Once I had agreed the design, size and colour of the plaque, I double-checked the wording on it. I paid for the production and delivery to Kellas, Solicitors. My next task was to arrange some kind of unveiling which proved to be much more difficult than I had ever imagined. A communiction from Katie es verra day means that it hisna bin possible tae get aathin thegidder for pittin up a plaque es eer! But we’ll leave es message here as we’ll maist certainly pit on an event neist year! So look oot for “Dufton Scott” in 2012! 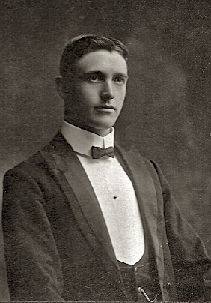 Dufton Scott was a noted writer of Doric plays and performer, including Gavin Greig’s “Mains Wooin”. Born in Forgue in 1880, he eventually ran a shop in Inverurie, dying in 1944. Not before time his grand-daughter, Katie Scott, is organising to unveil a plaque to her grand-father at the site of the shop, now Stronachs,(sic) the Solicitor at High Street, Inverurie. At this stage we do not have a date or time for the unveiling, but we have told Katie that we will be present and will help out with readings. 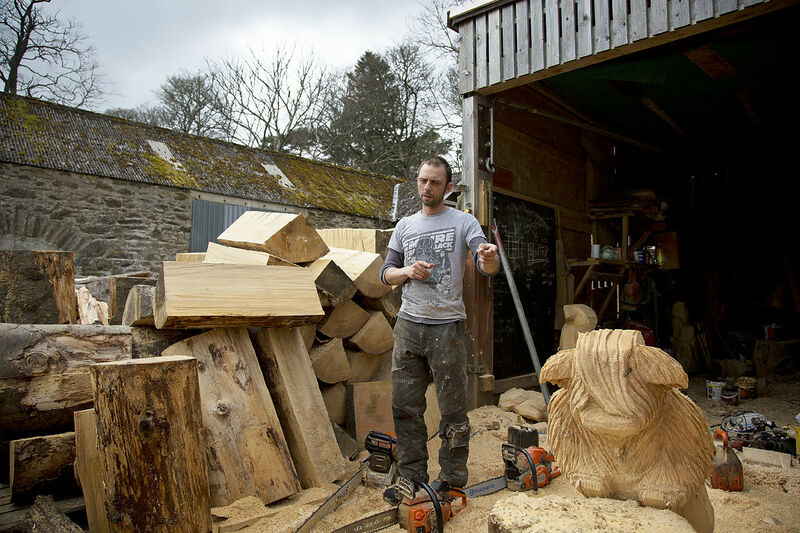 If like the Festival Director you remember Dufton Scott in his shop or if you remember performances of his works then this is an event you should not miss! Also supportive was Charles Barron, so it was with immense sadness that I learned that this great Doric playwright, academic, actor and teacher had died earlier this year. I am also sad that I have been unable to stay in touch with Sandy, so I do not have any information about this year’s Doric Festival. If anyone has this, I would love to know, do please contact me. Another who has been of great help is Lorna Alexander, who told me that she is to perform some of Dufton Scott’s work, as well has her own, in Inverurie on October 2 as part of the Luminate Festival. Since I have come to a complete dead end in finding out anything about this year’s Doric Festival, Lorna kindly invited me to attend her readings at the Acorn Centre. It will be wonderful to hear Dufton’s work performed, and exciting to see the plaque which will be erected by then, with one major correction. As I was going through my box of things pertaining to Dufton, I looked again at the flyer which had sparked my word hunt about Scots or Scottish. As I said, I have always loved words and dictionaries and am always keen to learn more. So I experienced a strange feeling as I looked again at the yellowing flyer, at my grandad’s handsome face, and at the strange way he had chosen to spell humorist. Why would he, a wordsmith, spell it incorrectly? My expression changed from puzzlement to horror. Oh no! Did I ever even check the spelling of the word? I dashed for my Collins English Dictionary, a huge tome, much-thumbed, heavy and lovely. I tore through the pages to find the blasted word. The correct spelling, of course, because Dufton would not have got it wrong, is humorist, although this really does look wrong doesn’t it? I scrambled to the phone, but it was a bank holiday and there was no answer from Leander Architectural. I got up first thing the next day, phoned, to be told that unfortunately the plaque was already made, and ready to ship that day. Thankfully, they agreed to stop the order but unfortunately the whole plaque had to be recast. As I said, a most expensive mistake, but I am sure the people of Inverurie will be happier to know that one of the town’s most famous residents is commemorated appropriately. A group of the Scott family is descending on Inverurie for the first week in October. We shall take pleasure and pride in viewing the plaque on the wall of Kellas, Solicitors. We are looking forward to meeting Lorna and hearing her performance of two of Dufton Scott’s pieces. 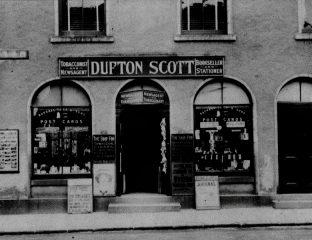 If you have any memories of Dufton Scott, do please get in touch. We could share a wee dram! It would be wonderful if we could also find the other grandchildren of Dufton Scott. Our father was Gavin Scott, but he had a brother, Robert, who had two girls, Frances and Margaret. What a joy it would be if we could trace them too. Expansion and Urban Sprawl are coming your way if you are in Aberdeen City or Shire. Peter Kennedy reports on the colossal proposal for the Elsick Estate which would change the complexion of Aberdeenshire forever. I wonder if any of you have been following the proposal to build a new town at the Elsick Estate, Cammachmore. This new town could become the biggest single town in Aberdeenshire, with an estimated population of 20,000+, outstripping the likes of Peterhead and Inverurie. In the initial plans, local residents were told the new settlement would be some 6,000 homes, but now it has come to the planning stage, it has emerged as a settlement of 9,000+ homes, an increase of 50% on the original proposal, and possibly even more in view of the elastic nature of such developments. The proponent of this development, David Carnegie, aka Lord Southesk, on whose father’s estate he hopes to build the new town, has made much of the ‘transparency’ of these plans, though little indication is given as to where the additional 3000 homes have come from. Given that each home will have on average 2 cars, this could see an extra 15000 – 20000 cars flooding the A90 corridor, daily, at peak times. Given their self-proclaimed reputation for unbiased reporting one might have expected that the BBC would have shown impartiality regarding this important development. Alas, this appears not to be the case. 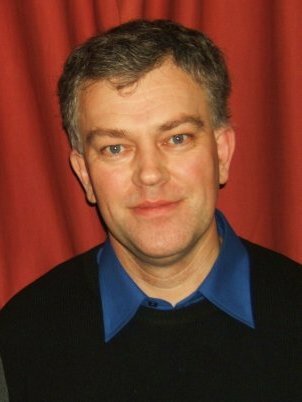 In an interview solicited by the BBC with a local resident, David Kennedy, which was broadcast on both BBC1 Scotland news and BBC Aberdeen radio news , the editorial team seemed more interested in the irrelevance that he had been involved with “Tripping Up Trump”, by handing back his honorary degree in protest at Donald Trump being awarded one. Although two BBC employees were present for three quarters of an hour for an interview at the Kennedy home last week, the BBCTV news only showed an old photograph taken almost a year ago this month, (28th September 2010) showing David Kennedy handing back his degree parchment – perhaps a little archaic even for a (un)biased broadcasting corporation. The issue of what impact the new town might have on the local environment was pushed to one side. Co-incidentally, Lord Southesk was given a number of minutes to air his views and ‘sell’ his vision. According to him, no-one in the surrounding villages is opposed to the proposed newtown -though they will undoubtedly be affected by it. The proposed site for the new town is 2000 acres of agricultural land, rather than any of the surrounding scrubland, which is more suitable for a development of this kind. Instead it is proposed to make a country park in this area of scrub land. Thus, at a time as a nation we are being encouraged to grow our own crops to cut down on global warming, etc some 2000 acres (approx 810 hectares ) of agricultural land will be taken out of production. This matter is now subject to a statutory 28 days consultation period as from Thursday 8th September 2011. 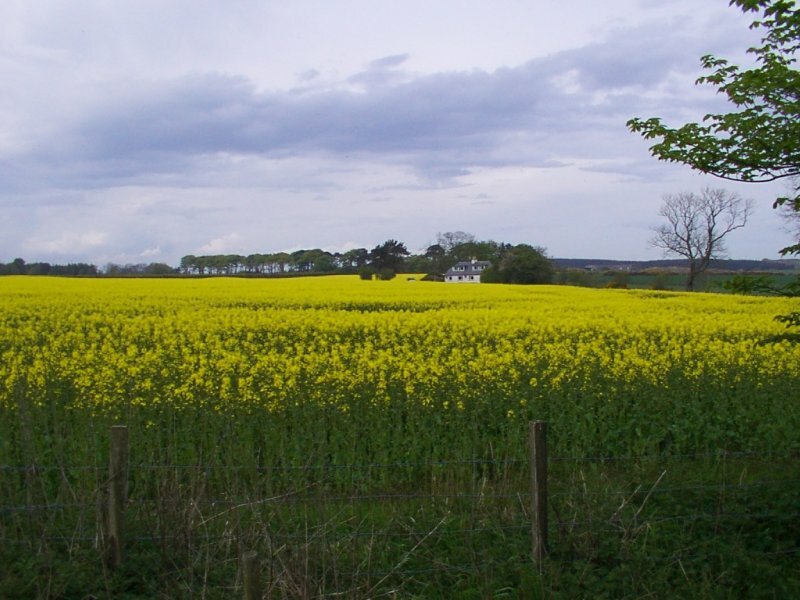 I hope people may feel able to make suitable representations to both the BBC for their biased support for the development, and the disgraceful denigration of David Kennedy; and to Aberdeenshire Council asking them to consider the impact of turning productive agricultural land over to the building of a new town. Malaika Africa’s charity event of X-traordinary proportions, the NEX Factor, has completed its round of auditions and selected ten hopeful contestants, each hoping to be voted as the audience’s favourite at the grand final. 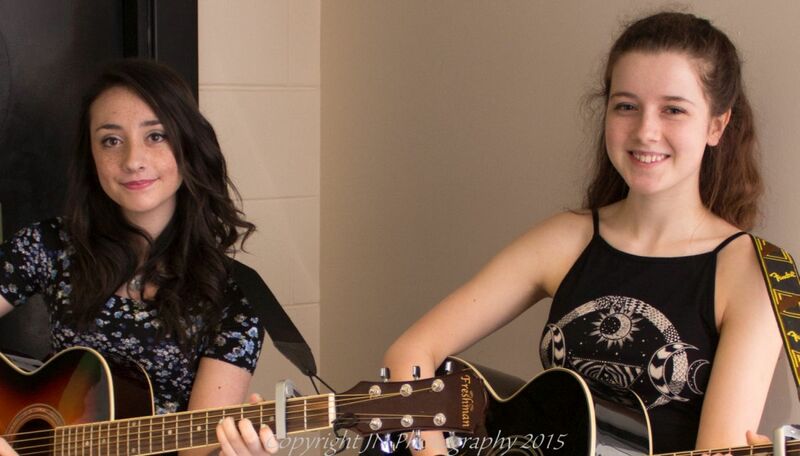 Aberdeen Voice weighs up the talent in advance of Saturday’s AECC final. 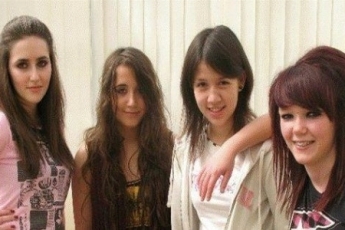 The contest calls upon teenagers to put their vocal and musical skills to the test to help raise funds to build a school for children in Tanzania. The NEX Factor has proven immensely popular, with judges finding it incredibly difficult to select their final candidates ahead of the live showdown this Saturday at the AECC. and Image In Me from Lossiemouth. These ten acts will go head-to-head in a live final in an attempt to wow the judging panel, and ultimately the audience who have final say in who wins. There are a few tickets still available for the show, which promises to showcase the very best in young talent from the region.